Signs of stability — and maybe a turning point? Our October labor market figures show a continuation of recent trends, with just a hint that things might be changing for the better. As we have discussed in recent months, the region has seen a steady decline in its unemployment rate. On the surface, that's great news. The problem is that we have achieved this rate, not by increasing employment, but by decreasing the labor force. 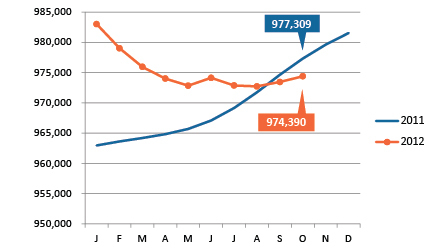 One encouraging sign this month is that the area labor force held steady at 1,041,266. Well, technically the labor force did decline very slightly — by 193 — but for our purposes, we’ll call that stable. Up until now, the labor force had declined every month this year. The second encouraging sign is that employment grew, albeit slightly. Recall that we are using seasonally adjusted data, so this growth is not from the seasonal spike in employment that normally occurs during the holiday season. Another bright note: help wanted ads reached their highest point in at least four years in October, with more than 23,000 new job postings. Not surprisingly, the Sales and Related Occupations category had the most ad activity, but it was followed closely by two categories not related to the holiday season: Computer and Math Occupations, and Health Care Practitioners and Technical Occupations. Overall, it hasn't been a particularly good year for the labor market, but with two months of data left to report for 2012, we hope we'll be able to look back on this year as a turning point. Employment grew slightly in October, but current employment levels are still a bit lower than they were one year ago. The labor force declined very slightly in October, at a much slower rate than the previous two months. 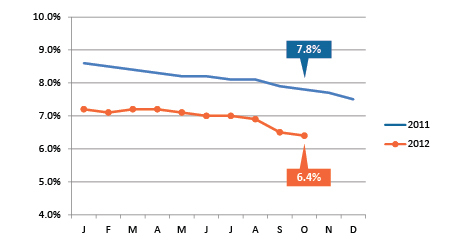 The region's unemployment rate continues its steady decline and now stands at 6.4 percent. 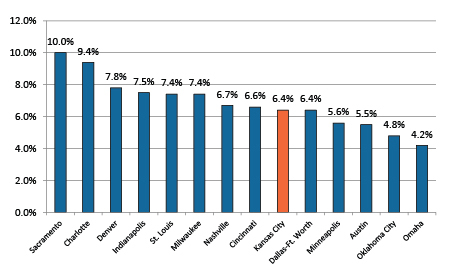 The Kansas City metro area unemployment rate continues to look pretty good relative to most of our peer metros. 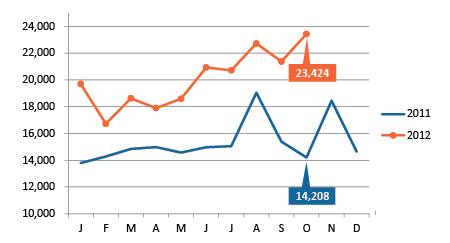 Job postings continue to climb, topping 23,000 in October. These figures are not seasonally adjusted, so we can expect to see holiday hiring activity to drive this figure up next month, too. Follow our new Twitter feed, @KCEconomy, to get the latest information on regional economic data. This time of year, a great deal of attention is placed on holiday sales. For many retailers, a strong holiday season can make or break the year. But the impact is even bigger than that. Personal consumption expenditures — the stuff we buy ― account for roughly 70 percent of the total economic activity in the country, so a strong holiday season has a real impact on our national economic health. The past few years have been tough. High unemployment and falling home values have had a big impact on consumer spending. But we seem to be turning a corner lately. Home values are rising again, the unemployment rate is finally declining, and forecasters are calling for a strong holiday sales season. The National Retail Federation is expecting a 4.1 percent increase in sales this holiday season. Our regional economic forecast examines the local economy by quarters, so we project retail sales for the 4th quarter, not the holiday season per se.The regional forecast for Kansas City calls for a 4 percent annual rate increase over last year in the fourth quarter. To put that in perspective, a 4 percent increase translates into a $1 billion increase in sales over the course of a year, or an additional $500 in retail sales for every person in the Kansas City metro. So just remember, when you head out to fight the crowds at the mall and wait in long lines to make your purchases, it won’t just be your friends and family who appreciate your efforts — the regional economy will benefit as well. Let's go make those cash registers ring!